This is awesome. I want to build them. Hi, will this work on a 15inch TV to convert it to vector (i don’t need the HV i guess, the flyback is working nicely)? Damn, after reading a bit more, and returning to a question i asked a while back on this site, i realise now that it won’t work. Too bad! it’s not going to work. but never fear! i’ve started working on a circuit to drive magnetic deflection coils. if you don’t want to wait, you could use the original Asteroids deflection board (in theory). the yoke will need to match the one from Asteroids, so you can’t just use the stock yoke from the 15″ TV. well, you might be able to rewind it. Would it be possible to post the Altium schematics? I use it for school and I would be interested in seeing them. I look forward to the connection tables. Thanks for posting the board files. Are they also gerbers if we don’t want to use OSHpark? Yes, Gerbers are in the Github repository. I suspect that on the ScopeDeflection pdf schematic the Vcc And Vbias connections around U1 are switched. Did you prepare any Pspice file for us to play with? thanks! no Pspice was involved. Hi! I have two small vector crt tubes around, 3LO1i and 6LO1i (which uses the same pinout btw). I was wondering if those ones are compatible? Thanks! Etienne, I have tested it with the 6LO1i which works fine. The 3LO1i should work BUT you will need to adjust the value of R2. Try using 33K instead of 20.5K, and measure the output voltage of the supply before connecting it to the 3LO1i, which has a rating of 800V. Sadly you can’t right click and download the Github files directly. You have to click the link for the file which will take you to a new page. On that page, click the “Raw” button and it will download the file. Sorry for the trouble. Managed to print out the three schematics. What a tease. Canceled my BitHub account in disgust. Can’t find a way to cancel OSH Park. I’d love to build and use your boards. I am absolutely blocked. Sorry Eric. Do you sell these directly? Alrighty then. Persistence, am I right? Managed to order the boards. Now on to the BOMs. If I can just figure out how to view them…. BTW, don’t click on a board at OSH more than once. You will end up with multiple orders! I have now finally worked my way through the project site madness. Ordered the boards, 3 sets, and enough parts to build all three of these from Mouser. Will share my experiences putting it all together when the parts arrive. So many CRTs, so little time! Cool do you still sell these kitted up? I have a ww2 9 inch magnetic deflection radar tube still in the case I would like to do this with. Just saw your post about the deflection coil as well. I would like to do that as well. really neat blog!!!! Bryan, I don’t sell these directly. The 9 inch CRT sounds neat, you should post photos! Unfortunately I don’t think you can get enough current out of my power supply board to drive it with sufficient brightness. Eventually I will post the designs for the magnetic deflection driver board, so you might be able to cobble something together with a different HV supply. Received all the parts for the HV and DEFL boards. Constructed all three HV boards last evening and tested them this morning. 100% success. All of them produce between 820V and 1,200V over the full range of the pot as advertised. Was able to assemble them using my old Weller soldering iron and head worn magnifying rig (nerd-o-visor). High voltage regulation appears excellent. Great job, Eric! Excellent! I tested load regulation using 2 megohm resistors in parallel. They got warm! Are the silk screen markings on J1 for D3 and D4 switched? I think the silk screen should read D1, D2, A2, D4, D3. Switching D4 and D3 allows my 3RP1A to work properly. It’s possible. Are you seeing a mirror image? Yes, that is what I’m seeing. Your design is nice since the pins on the PCB that go to the CRT follow in succession making wiring very straight forward. This is true for all pins. However, I need to connect D3 on the board to D4 on the CRT and D4 on the board to D3 on the CRT to get a correct picture. Have you tried your board with the new Sparkfun AVR Oscilloscope clock? I realize that your board may not have enough bandwidth, but I am having problems getting the Z-axis to work. Dennis, interesting about D3/D4. Do you have a link to the datasheet of the CRT you are using? I have not tried the circuit with the AVR oscilloscope clock. You might have to modify the source to slow down the output vector drawing. The Z-axis uses a positive-polarity video signal–3.3V turns the beam all the way on and 0V turns the beam off. I suspect the clock kit uses reverse-polarity video, in which case you would see very little. 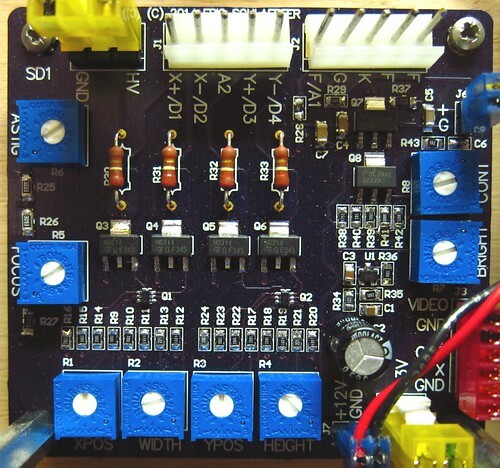 A simple common-emitter transistor inverter circuit should fix that for you. Eric. How do you connect the CRTs with the heater and cathode sharing a common pin? 1DP1 or 913 for instance. I simply jumpered the non-ground side of the heater to the cathode connection. Not sure what I’m seeing. My scope died yesterday. Back to telepathic troubleshooting. The body count so far. One 3JP7. One 3UP1. Three 1DP1s, a 1EP1, a 1EP11 and three RCA 913s. 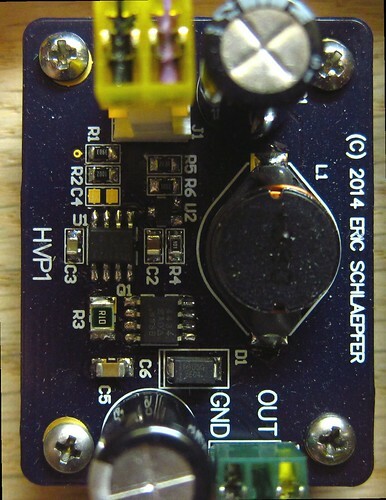 Driving your boards with AVR scope clock or Tiny TV Mk2. Thanks Eric! Oh. So you are reading this thread after all. I have to admit, the content of the last video was better than average. Still got those high standard Hooterville production values! Moved back to the scan board I designed years ago. I see that I included exactly zero emitter degeneration resistors in the diff amp. That could account for the excessive gain. I am going to add 150 ohms to all four emitter leads to drop the gain to around 100. Zero to three volts in to get +300 to zero volts out at the first MJE340 collector. Do you think adding emitter bypass capacitors will improve the frequency roll off? That will let you increase the gain at higher frequencies. Try it and see! Looking at ordering a set of the boards. One thing holding me back though, the need for an external transformer supplying 6.3v ac. I wanted to be able to produce a complete system that I can run from a 12V DC source. 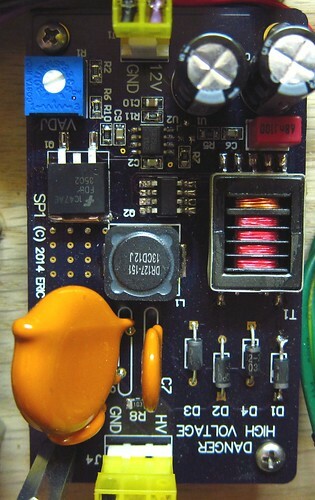 I have tried a number of Google searches, but can’t find anywhere showing a 6.3v inverter circuit. For low voltage applications, people just run the heaters from a DC source. Would that be possible with this equipment too? Andy–you can run a CRT filament on 5VDC if you want. Connect +5V to pin 2 of J4. (Pin 1 is ground and is tied to the main board ground). will you ever make prebuilds of these? I hadn’t planned on it. Many of the parts are available as through-hole, so you might be able to construct it from the schematic. Brilliant site. I ordered the boards and parts. Constructed the video amplifer just fine and seeing 60V just fine. Now I started the 1KV power supply. It’s all built, but am not seeing any HV at all. My smt soldering skills aint great, but I’ve had a good look with some magnifying specs and all seems to be OK.
Garry–Just work through the schematic section by section. Check pin 6 of U2 to make sure that the op amp is trying to turn on the FET Q1. Check the drain of Q1 to make sure that it is being held low as U2 tries to get some output voltage. Check either side of C1 relative to ground with a scope to see if the Royer circuit is oscillating. Look at pin 10 and 6 of T1 (the output side widely spaced pins) with a scope. Watch out, the voltage could be pretty high so try to set the scope to 50V/div if possible. There should be high voltage AC on these pins. With a DC voltmeter, check for voltage across C7. Check for voltage on pin 2 of U2, this is the feedback sense voltage. It should hover around 2.5V. Success! One working 1K power supply. I followed what you said, there was no oscillations. I replaced Q2 and everything works! I’ve assembled the deflection board, but its untested…. Shall report what happens if you are interested. I have been a big fan of you and your blog for the past few months! I have always had a fascination with tube amplifiers (and generally ‘older tech’), and luckily stumbled upon your site while doing some random research. I am so glad I did! I’ve have experience with a few audio projects over the years, but this will be my absolute first attempt with any sort of video – so I apologize in advance if I say something that makes me sound like an idiot. I ordered the parts to put the boards together – along with a few random NOS CRT tubes – because I thought it would be a fun project to ‘practice’ with until I figured out the direction I wanted to go with it. Would I be able to easily run your video board off of a computer’s VGA signal? VGA outputs separate (0.7v) red, green, and blue video signals as well as individual TTL-level (5v) horizontal and vertical sync signals. Would the unmodified 5v from the VGA sync signals be too much for this board? I wanted to attempt using this as an external text-only display terminal to see how the different tubes compared with displaying text. Thank you so much for providing us all with such great resources! Brandon–it should work fine. If you ordered the vector (XY) deflection board then you will need to build a ramp generator so it can operate from the sync signals. See this post. You’ll probably have to play with the brightness and contrast controls to get the VGA video levels to show up on the screen. What a fantastic project. I had thought of starting from scratch, but this project seems to have everything I want. Small question, I have a 6LO1I CRT, which has slightly different electrodes (at least in the Russian datasheet). Could this tube work in this project? The 6LO1I looks like it would work. You’d have to experiment a bit with the focus voltage but it should light it up just fine. Thank you very much Eric. Your feedback is really appreciated. I lit up the tube and it is giving a good display. The display changes with voltage from around 900V to 1300V and the intensity (G) voltage seems to change the astigmatism, rather then the intensity! Hello, im very impressed by your designs and im thinking of building the supply and deflection boards to drive two CRTs, encased in one device (2bp1 or 2bp11). Thank you because this is very useful in my research. Do i have to build two copies of each or can I tweak the design to save some parts ? I will make my own PCBs, for I cant surface mount. I just want to display two discrete stereo signals and dont understand the use of the third board as i never looked into video signals yet. Is this board solely related to video or useful in my case? You only need one deflection amplifier since you can share it between the two CRTs. You will need two video amplifiers so that you can provide a different video signal to each CRT. Since deflection is shared, you will need to blank one display while you paint the other one. Would it be possible to increase the bandwidth of the deflection amplifier to 1MHz or more? I’ve got a 7BRP14 that I’d like to see what I can do with. I figure if I get around 1MHz that would be fine for 192KHz audio DAC as a driver, and maybe toy oscilloscope use. I’ve got a video of it running with a single gun lit on YouTube. Not easily, unfortunately. You could decrease the values of the load resistors in the diff pairs to increase the current, but you’d have to use much bigger transistors as well. You’d also need a bigger power supply. That’s pretty much a different board. Thanks so much for these circuits ! I am looking at the psu board and I am wondering if the ‘optional 3kv pda multiplier’ part has been tested ? And am I right in assuming that the diodes are the same as D1-D4 and the capacitors the same as C7 ?